In the spring of 1958, President Eisenhower sent Vice President Nixon on a tour of Latin America to improve relations. Unfortunately, the tour would create even more friction, as it was punctuated by protests in various countries, including Ecuador and Peru. His May 13 visit to Venezuela turned violent and threatened the safety of the Vice President, his wife, and his support staff. Robert Amerson, who was Press Attaché in Caracas, explains the fragile transition Venezuela was undergoing at the time and how the public’s opinion of the U.S.– and Communist Party agitprop — made for a very unwelcome visit. Amerson was interviewed by Allen Hansen, beginning in 1988. See other Moments on Nixon. HANSEN: If the Nixon visit had come while [dictator Marcos] Pérez Jiménez was in power there wouldn’t have been any problems, because the regime had means to control political demonstrations. Vice President Nixon’s “good-will tour” around Latin America came about three months after the revolution, when Venezuela was still coming out of chaos. The police had disappeared when Pérez Jiménez fled the country. 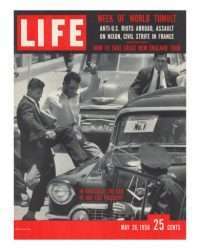 The sequence was something like this: In January of 1958 the people, in effect — specifically, clandestine political movements and dissident elements within the military — rose up against Pérez Jiménez because of corruption, because of widespread dissatisfaction under a regime where civil rights were restricted, where political prisoners were tortured. Everybody knew of something that they could blame the Pérez Jiménez regime for. He’d been in power, this tubby little colonel, for more than five years, talking about “economic democracy.” His regime was going to make the Venezuelans prosperous and happy by building roads and hotels on top of mountains, stuff like that…. He was overthrown, and one of the moments in my own life that I’ll never forget was the day he left. Because for nearly three weeks there had been ferment and tensions and people in the streets, riots and buses being burned, airplanes strafing the presidential palace, that kind of thing. Harry Casler, my PAO [Public Affairs Officer] at the time, called me about 2:00 a.m. to say he’d been informed by some of the politicos that we might soon hear the roar of the DC-4 that is carrying Pérez Jiménez out of this country. Literally at that moment, we listened outside: an airplane was taking off. Goodbye, dictator, never to be seen again, we thought. So he was gone and there was noisy jubilation in the streets the next morning. The national security secret police headquarters was sacked and burned. And the police disappeared because they were symbols of the hated regime as well. For the two or three days there was tension and potential chaos. But the Boy Scouts ran the traffic and people complied. There was looting of some of the houses of the regime officials but not widespread violence. They conducted themselves very well, the Venezuelans…. I can almost hear those voices now as we’re talking, those strident voices we listened to during the first days of the revolution, over the rebel radio. “Venezolanos, a la calle — let’s go out to the street!” You know, the call for revolution. Those sounds remain with one forever. Another sound of the revolution was honking of automobile horns in jubilation, and especially symbolic because horns had been forbidden by the Pérez Jiménez regime. Of course, it was very important for them that the American government soon recognize the revolutionary forces, and the role of the American embassy was important. Because there were several journalists involved in this underground movement I found myself involved in political communications for a while more than normal press attaché work…. Q: Then some months later Vice President Nixon came, which almost turned into a tragedy. HANSEN: That’s right. The revolution was in January; he came in May. And the reason it became a problem was because of the still-unsettled nature of the country. Of course it’s a given in Latin America that there’s going to be some general resentment about having to live in the shadow of Uncle Sam, whose every move can make a difference in the lives of his smaller neighbors. But now there were some specifics as well. Strong nationalist feeling about the United States over the years having cozied up to Pérez Jiménez, having in fact awarded him a few weeks earlier a special official honor. This was part of the Administration’s policy — maintaining stability, keeping the oil flowing, supporting U.S. investments and so forth. But the idea of officially honoring a military dictator was poorly thought through, because the popular resentment against the U.S. thus created was just enormous. That plus the fact that Pérez Jiménez by this time had sought and been awarded exile in Miami. So we were harboring their former dictator as well as Pedro Estrada, his hated secret police chief. All of these emotional things were causing heated resentment. But the main factor that produced impact and danger during the Nixon visit was, in a word, agitation. Professional planning and organization led, naturally, by the Communist Party of Venezuela, which had been prohibited under the dictatorship, functioned as part of the underground resistance and had emerged as national heroes to many. And they had effective anti-American material to work with. Well, this letter then was discovered by opposition forces when they wrecked secret police headquarters, and they held it as a bit of condemning evidence about American complicity with Pérez Jiménez. It was published in the new Communist newspaper, the edition just before the Nixon visit, showing a full-page photo of the VP, retouched to give him sharp, animal teeth. So by the time Nixon arrived there was a good deal of primitive political passion among certain elements, and some doubt within the embassy as to whether this visit was a wise idea. 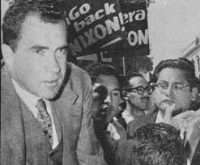 But the decision was made: we should not back down now, especially in the face of Nixon’s problem a few days earlier in Lima, San Marcos University, where he’d had some adversarial and highly publicized confrontations with students. So he and Mrs. Nixon arrived as scheduled on their special U.S. Air Force plane. What images this recalls, for anyone who was there at the airport! Who can forget the sight of those crowds that had been bused down by the professional agitators and organizers, the banners that had been printed up for it, their stationing themselves in the balcony above where the Nixons and the official party had to pass. This arrangement allowed the demonstrators to throw things down, shout epithets and even spit on the visiting Vice President and his wife. This agitation escalated into a major security problem by the time the motorcade reached the city and could have cost lives — including those in the Nixon party. Fortunately, in that mob scene, the cars did not turn over. They were badly beaten upon and dented, windows smashed, spittle all over them. They were a sight to behold! (I was just looking at a Life Magazine of that time a couple of days ago and it brings back the realities.) The official Nixon party finally took refuge in the American Ambassador’s residence. Q: They had to go all through town then. HANSEN: That’s right. They canceled plans to lay a wreath at Simon Bolivar’s tomb at the Pantheon, because the assistant naval attaché who’d been sent there with the wreath to give to Nixon had been attacked, in a sense, and the wreath taken from him, torn to shreds. There was such a well-organized mob around the Pantheon, that it was decided on the spot the Nixon party would not stop there but would go directly to the American Ambassador’s residence. Well, they made it safely. Some felt concern, even, that the embassy residence might be attacked, but that was never a real likelihood. There was a question as to whether the VP should give a press conference; this he did, and he conducted himself with great dignity. He’s never been higher in my esteem than he was at that moment, speaking with such reserve and calm about it not being easy to see one’s wife being spit upon, and that kind of thing, but still statesmanlike in his reaction although he was obviously seething beneath it all. So I gained some respect for the political leadership of Richard M. Nixon that day.